Uber has adopted a tactic with its drivers that parents use on misbehaving children: timeouts. 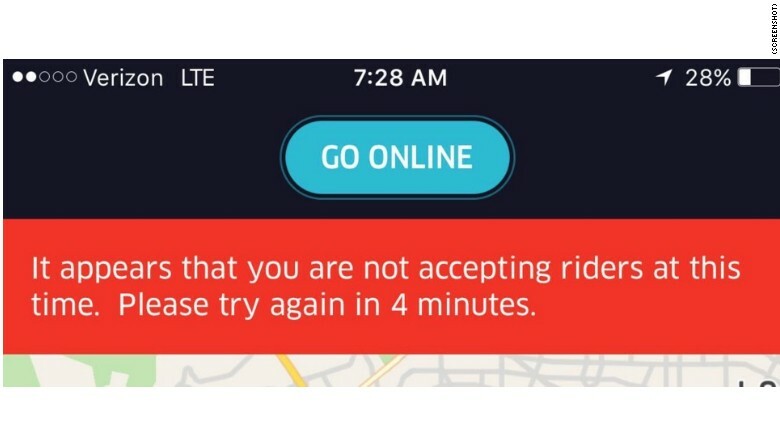 Uber drivers who turn down ride requests risk having their workday paused as Uber locks them out of its system for up to 15 minutes. Some drivers wait patiently for the timeout to end. Others just call it quits for the day. One Uber driver in Los Angeles told CNNMoney he's generally put in four 4-minute timeouts by Uber each day. The driver, who spoke on the condition of anonymity because of fears of retribution from Uber, refuses to accept any UberPool rides. Yet Uber drivers are generally unhappy with UberPool, according to interviews with two experts, seven drivers and an extensive review of online forums where thousands of drivers congregate, including Facebook and Reddit. The Independent Drivers Guild, which advocates for New York's 35,000 Uber drivers, calls UberPool a top issue for drivers. Drivers say UberPool means more work, but not necessarily more pay. Many also complain that driving for Uber Pool hurts the ratings customers give them. They say the customer experience is negatively influenced by going out of the way to pick up another rider, and then sitting next to a sometimes undesirable passenger. 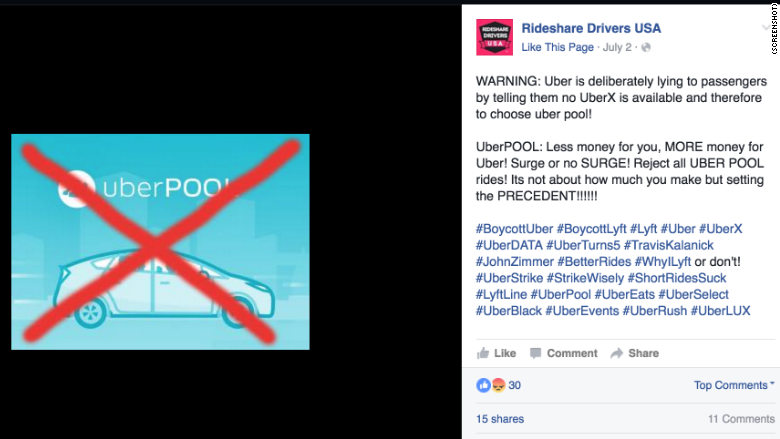 "They do it begrudgingly," Harry Campbell, founder of The Rideshare Guy, a ridesharing blog, said of drivers participating in UberPool. "They're basically doing the same trips, but now they have two people in [their car] and they get paid about the same amount." Campbell expects the timeouts to become a big issue as UberPool spreads to more cities. Uber first tested UberPool in San Francisco in November 2015, and has since expanded it to at least 45 cities globally. "I've never heard a driver say 'I love UberPool,'" said Alex Rosenblat, a researcher at Data & Society who has studied Uber closely. Some Uber drivers have taken to calling the service UberPoop or CessPool while talking with other drivers in person or online. "The pay is not worth it," said Eric Roberts, who has driven for Uber on and off in San Francisco the last two years. "You're constantly running around putting wear and tear on your vehicle for small fares." He turned down an UberPool request in May and said Uber then put him on a 15-minute timeout. Roberts, who commutes three hours into San Francisco to drive for Uber, has since stopped driving for the service. He said when he started driving for Uber in 2014 he sometimes pulled in $600 during his 20-hour days. This year he said he'd rarely made more than $200 during a similar shift. He blames UberPool's low payouts, as well as less surge pricing. Adding to the challenge for drivers, there's little transparency about exactly when and why drivers are put in timeout. Uber declined to offer CNNMoney any details about the timeouts, other than referencing its policy, which states that if drivers have a low ride acceptance rate they may be temporarily logged out of the app. 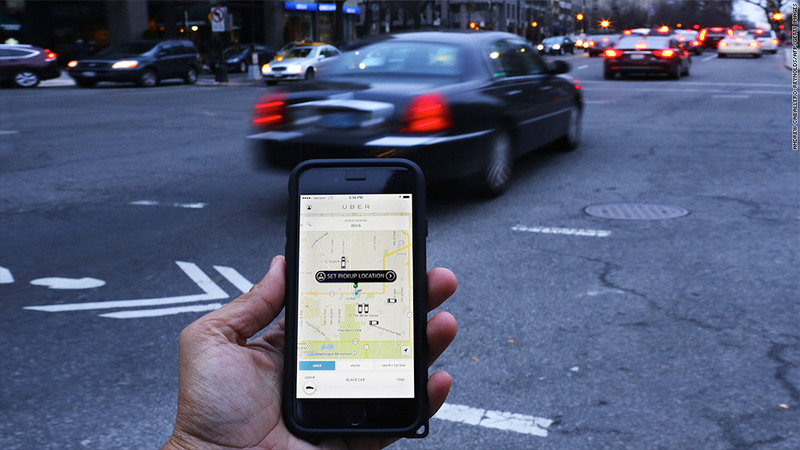 Uber said high acceptance rates are critical to ensure a reliable, high-quality service. Using timeouts is a subtle way to encourage higher ride acceptance. According to drivers and Uber experts, the timeouts generally occur after turning down two or three ride requests. The Independent Drivers Guild has asked Uber for more clarity on the consequences of rejecting Pool rides. The timeouts have also reignited the controversy over whether Uber treats its drivers like independent contractors or employees. "You're saying to someone -- you're your own boss, but also go into the penalty box because you didn't behave in the way that we suggested you should," Rosenblat said. For those who think Uber already treats its drivers like employees, the timeouts are another piece of evidence. "True independent contractors have the freedom to decide when they want to work and what kind of work they want to do," said Benjamin Sachs, a Harvard Law School professor. "By giving drivers timeouts, Uber is exercising the kind of control over its workforce that employers exercise over employees."